The 2014 Nissan Pathfinder or the 2014 Honda Pilot? When you’re seeking a brand new family vehicle in Central Illinois, you know that a Central Illinois Honda Dealer is bound to have plenty of choices available for you, right? We know that many drivers are looking at vehicles like the 2014 Nissan Pathfinder, but we think that the 2014 Honda Pilot will better serve you and your family, providing a greater value. Let’s see how they stack up. When drivers look for new vehicles, there can be many factors that come into play. One of the most common ones we get in Central Illinois, however, are questions of a vehicle’s value. 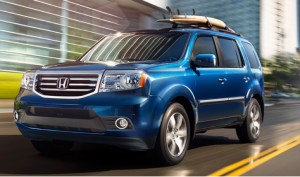 That means more than just its price—though rest assured that the 2014 Honda Pilot is affordably priced. These are just some of the features, and while Nissan does make some similar ones available—you won’t find the Honda i-MID on any non-Honda vehicle—you will have to upgrade to get all of the features that come standard on the Pilot. Indeed, the entry-level Pathfinder S boasts a six-CD changer, keyless entry, and cruise control as the height of its technology. When you want to know just what it’s like to get behind the wheel of a brand new Honda vehicle like the 2014 Honda Pilot, you know that you can visit a Central Illinois Honda Dealer for a test drive, right? We have seven locations that make it easy to get behind the wheel of a brand new Pilot; stop by today! 0 comment(s) so far on The 2014 Nissan Pathfinder or the 2014 Honda Pilot?